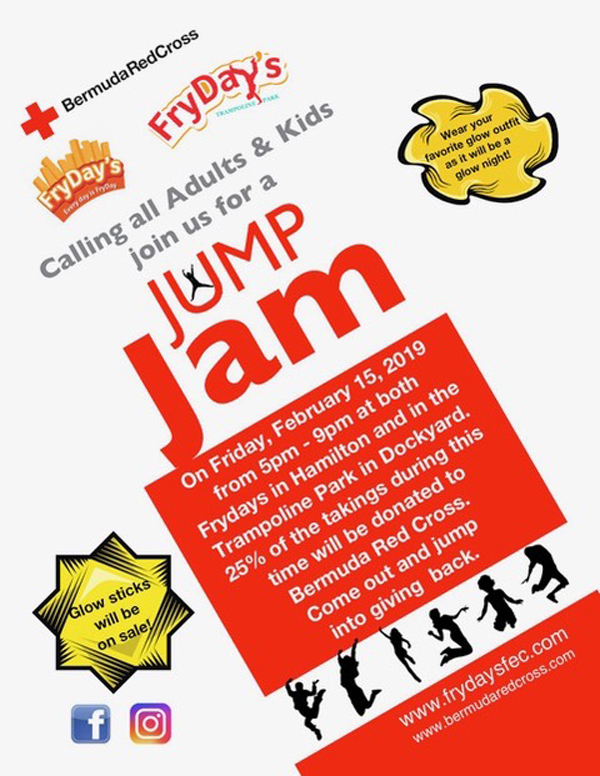 FryDays Restaurant will be hosting a Jump Jam on Friday evening [Feb 15] at the Hamilton Play Time Zone and the Trampoline Park. A spokesperson said, “Calling all Adults and Kids, join us for a Jump Jam on Friday, February 15th. This will take place from 5pm – 9pm at both locations of FryDays; the Hamilton Play Time Zone and the Trampoline Park . During this time 25% of the takings will be donated to Bermuda Red Cross to support our community projects. “The Play Time Zone provides an indoor playground, arcade games, lego wall, toys, candy and great tasting food. The Trampoline Park will be glowing that night and glow sticks will be on sale to add to the glow. You can jump freestyle, test your jumping skills, shoot basketball hoops, slid into a foam pit, play dodgeball or volleyball or even challenge a friend in a jousting battle.